Food, shelter, exercise and regular visits to the veterinarian are all a part of the basic care package that accompanies dog ownership. However, there is one more important aspect of proper canine care that must not be forgotten or neglected, and that is grooming. In order for a dog to stay clean and healthy, proper hygiene must be maintained, and given that dogs can do little more than lick themselves to remove the occasional annoying substance, grooming of your animal is your responsibility. 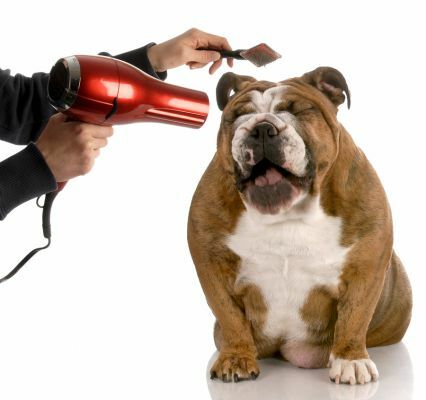 Since giving your dog a bath is probably the most taxing and difficult part of the required grooming regimen, we might as well start there first. Bathing is one of those things that the earlier you start, the better. The more you handle your dog, the better. It builds trust, creates and maintains a bond and when you really need to handle her, following an injury or something, she is used to you touching her and handling her. This is a very tricky area to advise dog owners, given how much there is to weigh. You want your dog clean and smelling nice, however, bathing too frequently can over dry your dog. There are natural oils on her skin, underneath her coat that you find so “phew!” offensive that when eliminated cause skin irritation and make it difficult for her to ward off the simplest of infections. So how do you strike that balance, especially if you have your dog living inside with you? How often a dog needs a bath is going to depend to some extent on how much time she spends outdoors – running through bushes and brambles, sticking her nose into things, rolling around in things, and just generally finding ways to get herself dirty while having a lot of fun. If your dog is not picking up nasty things in her fur while spending a lot of time outside, then perhaps when she does attract mud and other sticky things, you could hose her down with warm water, dry her and brush her. A “ferminator” is an amazing tool that helps give the appearance of having had a bath, while it distributes the oil on her skin and doesn’t over dry her. There will be those times when you just must bathe her with soap. There are many on the market without sulfates (detergents), which can dry out her skin. The frequency with which it is actually healthy to bathe your dog may surprise you. No more often than once a month is advised and again, a sulfate-free shampoo is best. The amount of brushing a dog’s hair needs is directly proportional to the length of that dog’s hair. This is a mathematical principle that was originally formulated by Albert Einstein, who unfortunately forgot to practice his theory of brushing relativity on himself. If you have a dog with short hair, once a week might be enough, but if she has long hair, once a day might be a minimum requirement. Rather than using an old human hairbrush to accomplish the task, as many people do, it is better to purchase a brush with soft rounded tips specially constructed to protect a dog’s sensitive skin. If you have a long haired dog, even with regular brushing they may occasionally develop mats in their coats. When this happens it is better to use a device called a mat stripper, which can be purchased in a pet store, rather than risk trying to cut the mat out yourself with a scissors. It is important to note that some breeds require more brushing than others, regardless of fur length. German Shepherds, for example, shed buckets of fur. The owner of a GSD knows all too well that daily brushings will need to be followed by daily vacuuming or sweeping. Some of the grooming tasks that one must perform on dogs are not entirely pleasant. But the chances are that both you and your dog will enjoy brushing, especially if your dog has longer hair. Brushing is a peaceful, affectionate activity that should bring pleasurable sensation to your animal, and relaxation plus happy smiles to both of you. 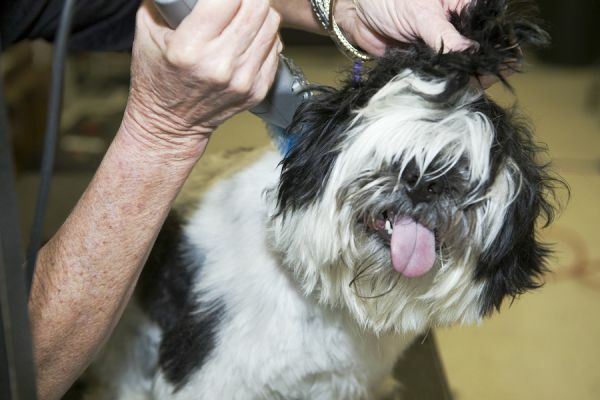 In some longer-haired dogs, brushing will not always be enough, and you may occasionally have to take them to a professional groomer to have their hair trimmed. There is good reason why the term ‘dog breath’ is used in the pejorative. In order to combat the evils of dog breath, it is necessary to brush and clean your dog’s teeth on a regular basis. Doggie toothpaste is available, and it tastes so good that most dogs will just love having their teeth brushed on regular occasions. Okay, so that last part is not true - most dogs actually hate having someone poking around in their mouths, and trying to brush her teeth is probably going to be only slightly less pleasant for you than trying to give her a bath. Nevertheless, it is something that has to be done from time to time, so the best thing to do is just grin and bear it. Some believe that bad breath in dogs is at least partially caused by feeding your dog only processed, commercially produced dog foods. This has not been scientifically proven, but it is at least something to keep in mind, if you are open to feeding your dog a diet largely comprised of foods normally consumed by humans, which some claim is a healthier alternative than dog food. Tip: In lieu of brushing your dog’s teeth, giving him or her deer antlers (which fall off naturally and are not extracted from deers) instead of rawhide bones helps keep tartar off their teeth. The bone marrow present in the antler is what cleans dogs’ teeth and gums. Clean teeth means elimination of dog breath! A dog’s ears can be a factory for producing all kinds of unpleasant situations, such as excessive waxy build-up, or infections by mites, yeast or bacteria. Long floppy dog ears are especially troublesome, because they prevent air from reaching the inside of the ear, which creates an environment conducive for microbes to blossom and grow. Once these infections occur you will have to get something from the vet to treat them, but you can help prevent them by cleaning out your dog’s ears on a semi-regular basis with cotton balls and just a bit of mineral oil. One area on a dog’s body that can easily be overlooked are the paws. Of course you may need to trim her nails every once and awhile, but it is also important that you remember to check between the pads to make sure your dog has not picked up thorn or a pebble or a small piece of glass from somewhere. The undersides of a dog’s paws are soft and vulnerable, so you also need to occasionally check to make sure she has not suffered some kind of cut or injury that might need treatment with antibiotics. Grooming is fun – this is what you need to tell yourself and your dog, over and over again, until you both believe it completely. Once you have accomplished this act of mutual hypnosis, grooming can then become a wonderful time of bonding and sharing that the two of you will experience and enjoy together for many years to come. Believe it, and you can make it so.